I've noticed there's this image out there among the general populace that videogame developers are all super-mega gamer dudes who go into work to mainline some form of Xbox ecstasy through an IV drip at their desk. Funnest job in the world. You get to play awesome games all day, hang out with your friends, dissect your latest sniper headshot in gory detail to a rapt audience and get paid for it all. Sorry. I'm here to tell you that particular cake is a lie. Making games is not fun. (Except when it is.) Making games is a special kind of torture from which sane men run. I just got out of a 3.5-hour meeting full of programmers who look like zombies from lack of sleep. Nobody there was having fun. (Except for about 10 minutes near the end.) This was not an unusual day. Grueling marathon meetings are pretty much par for the course. Designer Dan Cook (owner of game design website Lostgarden.com, who is currently working on new versions of his games Steambirds and Bunni) describes it like this: "I come from an art background, so I use the painting metaphor. Anyone can look at a painting and instantly give their opinion on why they love it or hate it. But it is a completely different skill to stand at a blank canvas and then spend hundreds of hours fiddling with brushes and colors and lines and form to create the painting. Can you compare a trip to the museum to endless nights spent alone in a cramped closet of an attic studio passionately pursuing a labor of love? Viewing is nothing like painting. It is at best one tiny component of a craft and art that requires decades of practice and dedication. Worth thinking about when someone says that they might be good developing games because they like playing them." It's not just the meetings. When you're free of the hostage situation of endless staff check-ins, you've got your head down, face buried in your keyboard (or your fancy tablet thingy if you're an artist), trying to produce just the right material for the deadline looming way too close. The pressure to be innovative, creative and clever - while not being so over-the-top your players get lost - never ends. You're required to sit down in that chair and generate magic out of nothing. "Get to it, you're holding up the entire process. Come on. 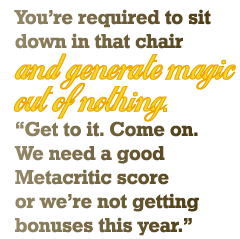 We need a good Metacritic score or we're not getting bonuses this year." That slowly blinking curser on a blank screen can feel like the countdown on a bomb that you have to defuse. Being creative on a deadline can be hell. Plus, you have to work with all these other people. The inner workings of games are kind of complicated and often require a group of specialists to work together on common goals. This is easier said than done when most of the specialists (including yourself) are geeks with stunted social skills. "Please," "Thank you," and even eye contact can be too much for some of us. We interrupt each other constantly, go off on tangents, monopolize the floor. It's like a case study on how to communicate ineffectively. And when the group has managed to pull a new game out of thin air and sit down and play it for the first time - 99 percent of the time it's no fun at all. Think of it this way: For any given game there are a finite number of things that are fun and also within budget. However, there are an infinite number of things that are NOT fun and also within budget. So the result is that anyone creating a game will spend the majority of their time having no fun at all as they hunt for those few, special things that are both fun and possible to pull off with the resources at hand.